Thirty-two players will be drafted in round one. 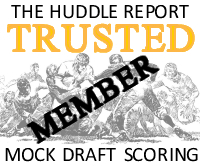 The number of players receiving ‘legit’ first round grades will be a much smaller number. Teams don’t grade 32 players in round one, 32 in round two and so on. They might have a very small number of players they’re willing to grade in round one. On average you might get 12-18 players in the first frame. Last year I thought there might be between 10-15. I thought there might be approximately 14 in 2016. It’s still too early to say for sure. The Senior Bowl and Combine always impact the list. My projection today would be at least 14-18. It would’ve been higher had Derrick Brown and Raekwon Davis not opted to stay at Auburn and Alabama respectively. Kyler Murray today declared and as I’ve been saying for a while, I think he’s the most talented player in the draft. I wrote about him being the best draft eligible quarterback, built an argument for the Seahawks drafting him, put him at the top of my tiered rankings with Nick Bosa and argued the Cardinals should think about taking him with the #1 pick. I don’t think there’s any doubt he’ll be a first round selection. The question is — how early does he go? Will he be the first pick taken by either the Cardinals or a team trading up? Does he get out of the top-10? John Schneider attended the West Virginia vs Oklahoma game. I’d imagine one of the reasons would’ve been to see Murray in person. Why wouldn’t you? He’s a phenomenal talent. “I don’t know what you do with a guy that’s 5-9 but he is something special… He would be a shorter version of Patrick Mahomes. He can be that special. He’d probably run like a 4.4 something. He’s a better football player than Baker Mayfield because he runs so well. The Mahomes comparison, for me, is profound. They’re cut from the same cloth. Different body types. Not identical playing styles. But they have that same ability to throw with power and accuracy all over the field, make the improbable happen and be a complete playmaker. I wouldn’t have any issue with the Seahawks drafting Murray as insurance to Russell Wilson. If they can’t extend Wilson and need to franchise him twice (in 2020 and 2021) or even if they extend him for four more years — have the heir apparent ready and waiting. Give yourself a bargaining chip in negotiations with Mark Rodgers. There’s nothing wrong with having a quality backup. You can always trade him (see: Jimmy Garoppolo) and the Packers spent two high picks preparing for life after Brett Favre (Aaron Rodgers, Brian Brohm). It’s highly unlikely Murray lasts into range for the Seahawks but I’d have absolutely no issue with them taking him. Even if Wilson enjoys many more successful years as the starting QB. You just can’t pass on a talent like this. So what about the rest of the draft and possible ‘legit’ round one prospects? The top three in the class are probably Murray (QB, Oklahoma), Nick Bosa (DE, Ohio State) and Quinnen Williams (DT, Alabama). Clelin Ferrell (DE, Clemson) isn’t too far behind and neither are his Clemson team mates Dexter Lawrence (DT) and Christian Wilkins (DT). The NFL is dominated by big, athletic pass rushers. Plenty of teams will be prepared to draft Rashan Gary (DE, Michigan) in the top-10 despite a slightly disappointing college career. His upside as a former #1 recruit is unquestionable. Devin White (LB, LSU) can feel very secure about his place in round one and if Devin Bush (LB, Michigan) has a big performance at the combine, he’ll claim a first round home. There are fair concerns about Ed Oliver (DT, Houston) and his next-level role. He’s undersized to play defensive tackle but lacks the length or frame to play defensive end. Even so, his athletic profile and talent likely secures a top-15 range. Jachai Polite (EDGE, Florida) and Josh Allen (LB, Kentucky) will also hear their names called in the top-20. That’s 12 on my list so far. Jeffery Simmons (DT, Mississippi State) undoubtedly deserves to be given a first round grade based on his play and incredible upside. We’ll have to wait and see how teams view his stock following a serious incident in High School that will leave many uncomfortable selecting him early (or at all). Oklahoma tackle Cody Ford also deserves a mention. He has a massive frame but moves with excellent agility and has a terrific kick-slide. At the very least he could be a fantastic guard at the next level. I personally wouldn’t include Dwayne Haskins (QB, Ohio State) but many teams will. Quarterback-needy teams could also consider Daniel Jones (QB, Duke) and Drew Lock (QB, Missouri) in round one. Greedy Williams (CB, LSU) could end up being a consensus first rounder but not for me. I’m equally unconvinced Jonah Williams (T, Alabama) warrants such a grade. You could certainly make a case for Marquise Brown (WR, Oklahoma) but he’s probably more of a R2 grade who still goes in the first frame. Byron Murphy (CB, Washington), Zach Allen (DE, Boston College), Jawaan Taylor (T, Florida) and Dre’Mont Jones (DT, Ohio State) are in a similar position. I suspect there’ll be mixed grades on Greg Little (T, Ole Miss) and Jaylon Ferguson (EDGE, Louisiana Tech). This is why the combine is such a vital event — how much athletic potential do these players have? Especially those needing to work on technique. Mack Wilson (LB, Alabama) has first round potential after opting to turn pro. Alabama often left him as the deepest player on the field on key passing downs. His coverage ability is a big plus and he hits like a hammer. The combine will be big for the receivers and tight ends. Both positions have depth without an obvious order of talent or a clear prospect who goes early. Win at the combine and we could see some big risers. The worst case scenario is we see a lot of WR’s and TE’s leaving the board in round two. Wisconsin’s Michael Deiter is a player who intrigues me a lot. He’s about 6-5 and 320lbs. He switched from left tackle to guard and he looks at home in the role. He previously had limitations against speed and the top athletes working the edge. Now he excels as a terrific interior mauler. He gets into blocks quickly and is very capable of locking on at the second level. He plays with a nasty edge and will often play to the whistle (and beyond) and bury defenders into the ground. He anchors well and you rarely see him jolted off the LOS allowing penetration into the backfield. There’s evidence of him pulling to the right and sealing blocks in the run game. I don’t know how early Deiter will go but he looks like an early starter and a player with the potential to start for a number of years at left guard. Keep an eye on him at the Senior Bowl. I’d give him a second round grade at the moment. He could easily land in the top-45. I had him at #39 in our first two-round mock. So how does the class look in terms of legit first round grades? Not bad at all with room for more after the Senior Bowl & combine. What makes this draft class so unique is the way it’s weighted to the defensive line. Other traditional ‘cornerstone’ positions like left tackle, cornerback and receiver are weak at the top of round one. Linebacker will also be seen as a first-day strength. But there are just so many talented D-liners. We could see ten (or more) go in the first round. I noticed you have not put D’Andre Walker as a 1st round grade. If this is the case I would absolutely love for the Seahawks to get him if they trade down. He would definitely be a perfect fit for this team. I’m a big fan of Walker as well, just think he’s more of a day 2 guy. Also really like Florida LB Vosean Joseph. Sets the tone, flys around the field, great run defender. Plays with reckless abandon which could be his drawback, but he’s a perfect fit for what the NFL currently wants at LB. I like Joseph as well, but I feel like he’s too small to play the edge imo. He would be a solid pro at linebacker in the NFL for sure though. I heard some tv guys debating where Murray will go in the draft, thinking that a GM might be reluctant to draft such a small player at the position. After RW you would think that concern would be past, but RW is actually obviously taller and bigger than Murray. So is there any way he takes a Rodgers-type fall in the draft? If I was a GM – particularly of a rebuilding team – I would have some worries about drafting Murray. I think he was measured at just under 5’10” and 195 pounds (how much could he add to his frame?). I know Russ took a lot of criticism for being under 6’0″, but 5’9″ is really short. And if he was on a team with a bad line, he is probably more likely to get injured. He’s a spectacular talent, but I think the size is a legitimate concern. 2018 stats: 74 rec, 1045 yds, 9 TDs, 14 YPC. And thank you Rob for that last post and for everything else you do here for us. ‘Preciate more than you’ll ever know. Speaking of which, anyone ever hear back from Sean? If you’re reading this please give a shout out. It’s tough getting the real contact we need as humans these days but no one is truly alone. And SDB is a real community, that’s what makes it special. I have not heard from Sean. It may simply be that he needs some time away from the internet. But if you’re reading this Sean, I hope you’re OK and please know there are people here ready to help if needed. That’s a big plus one there, V12! Rob, you make the off-season great! Thank you guys for continuing to visit. And if you ever need anything, just send me a note. Murray is the prototype for the NFL QB of the next decade. The league is moving towards being borderline QB friendly (with the right scheme). It’s moving towards mobile QBs. A lot of the older pocket passers are almost done. Mobile QBs with big arms IMO will be the most successful very soon. Mahomes, Wilson, Murray, Mayfield, Allen, Jackson all may be the best QBs in the NFL in the late 2020s. The agility times are insanely good for a guy his size. They would be good for a DB. Plus he has an absolutely incredible motor. Will be a fun guy to monitor this week for sure. Great article, Rob. Also noticed a like-minded appreciation of Kyler Murray’s skill-set at PFF today. “When it comes to projecting Murray’s NFL Potential, we here at PFF see a game-changing player at the quarterback position that can keep plays alive and change the face of an NFL franchise. Looking at the numbers, Murray’s 2018 season jumps off the page: 42 touchdowns, 11.6 yards per attempt, 143.9 passer rating when clean and a 94.7 overall grade. He finished the season as highest-graded overall quarterback and the second highest-graded runner among quarterbacks with an 85.0 rushing grade. He posted a 143.9 passer rating while clean, narrowly edging out Tua Tagovailoa and tossed 36 touchdowns. He showed his touch on the deep pass as well, with a 51.9% adjusted completion percentage on deep attempts (20-plus yards). The Heisman Trophy winner shined in many facets on the field, but his highlight real came alive when he evaded pressure and escaped the pocket. Pay KJ , sign Mychal Kendricks, sign a free agent, or draft someone but doing nothing isn’t an option. Assuming we trade down and Polite, Allen, White, and Bush are out of reach who are the top draft candidates in round 2 or 3? BTW it’s thought to be a bit of a down year for linebackers. Walker is tweener so he could fall. Great build but not fantastic athlete. Combine will be important. I agree with Rob on this dude. If he has a decent combine his production and character will push him up the board. Good in coverage and hard, hard hitter, great character, winner. Tough to find scouting reports but no denying his production. Again a little under the radar but a 6’2″, 245 lbs with 4.55 speed he’s someone to keep an eye on. Productive from a national champion team he 6’3″ at 243 with 4.65 speed and adept in coverage. He’s 6’4″, 241 lbs but he’s more of a middle linebacker. That said I’d love to have him on my team. Has received some Van Esch comparisons. Smaller guy at only 225 lbs but is very quick but I’m not sure he’s fast. Who do you folks like? There’s not a lot of consensus yet after the top 4. My favorite is Mack Wilson but he’s probably a top 40 pick if his combine is decent. I like Tre Lamar and Jermaine Pratt. Paddy Fisher seems more Patriots than Seahawks but I sure we we have Van Esch so who knows. Who else do you all see out there? Which of these are the most Seahawky? Boise state RB Alexander Mattison 5’10 214lbs best player in Mountain West. If he shows some speed & quickness he’s the next Marshawn Lynch. Mountain West loaded with NFL LB prospects had a heck of a time tackling him. Non NFL LB prospects were afraid to tackle him. Fresno State Free Safety Bell consistently made business decisions and unsuccessfully tackled Mattison below the knees even when in goal line defense. The dude is an absolute beast with phenominal technique also a great receiver. There’s every reason to believe Murray will be off the board well before the Seahawks pick in the first round, so this question is mostly an academic one meant to stimulate conversation and serve as an excuse to look at different talent in the draft (i.e. pass rush beyond the first two frames). How do the Hawks go about accomplishing their offseason mission with the remainder of their draft if Murray falls into their hands and they select him with their first pick as a can’t-miss prospect? I think they would consider trading back a couple of times so it would depend on Murray being available after that. If they have 6-8 picks I think they can achieve their mission even after selecting Murray. Before I start: I do NOT believe that the Seahawk’s way of running the ball doesn’t need a top QB as much as any other NFL franchise in order to be able to compete for the title. Said that: Let’s imagine on day 1 of the draft the Giants are up at 6 and Kyler Murray is still on the board. The Giants offer us their Rd 1 and Rd 4 pick in 2019 and their Rd 1 pick in 2020 for RW. So how good could Murray be in year one, in year two, … compared to a RW in his prime? How good could the Seahawks be, with more quality draft picks and more cap space to work with? I think the Seahawks will be significantly weaker without Wilson and it would take some time for Murray, as good as he is, to make up the difference in terms of performance. Wilson is an elite talent. RW just finished the most effecient season of his career, set career marks nearly across the board, and literally had a perfect rating throwing to Lockett. Often, the Offense moved BECAUSE of RW and only due to his brilliance, not despite his limitations. RW also throws the absolute best deep ball of any QB in the NFL, a HUGE key in the Hawks desired offense. Run, control the clock and pace, take shots down the field when presented the opportunity. RW is tailor cut to be the Hawks QB, both in terms of his ability/limitations, and the offensive style they want to run. Do you really want to take a chance on another rookie QB? One that may or may not turn out half as good as RW currently is? I am firmly and 100% against trading RW. We’ve seen far too often over the last few years that He is more than capable if given a chance, and quite often is the ONLY reason the Hawks are not a 4 win team. IF you were going to roll the dice by moving on from your proven star QB to play a rookie, I think you would have to have a much stronger roster to be able to compete. You would have to have a defense that can consistently hold opponents to <18 ppg. You would need a stronger supporting cast on offense too, and a scheme to provide easier throws to open WRs. Many times his WRs were not open, but he delivered an impeccable deep bomb. Seattle's offensive efficiency is driven by Wilson. You just are not going to get that next year from a rookie. My question to this question is; did Pete Carroll sign a short extension to 2021 to trade away RW and usher in a rookie, or did he sign that short extension because he sees a three year window to get back to the Super Bowl with RW? It’s somewhat interesting to me that if Seattle played the two years in a row franchise tag game with RW, that would take him to 2021 with the team. The same year that both Carroll and Schneider’s contracts run out. I guess I agree with all of your reasoning. Just dreaming about the possibilities you would have draft- and cap-wise! I’ll let this make my argument. Even if they wanted to trade RW (which no sane GM would ever do) that wouldn’t be nearly enough. A top 5 at worst QB? That would demand a king’s random, not a couple of firsts. If we traded Wilson (which we won’t and probably shouldn’t) I would rather have it be because we got Nick Foles in FA. I think the market for Foles will be decent enough where I can’t imagine would would look at this angle, though. I think the drop-off between Wilson and Foles is large enough where either the defense or the OL would have to rise to elite status to make up the difference. Since Bortles is on the way out I’d rather trade him to JAX for their 2019 first rounder, Jalen Ramsey, and a future 2nd rounder. I do think you have to question why we would pay upwards of $35 million APY for our QB when the head coach wants to run so much. You don’t just let franchise QB’s walk away. But I also the financial priorities of the team should be somewhat in line with the philosophy of the head coach. You would trade away a future hall of fame QB in his prime with many years left, for a 1st, 2nd, and Ramsey? I say this as politely as I possibly can, but you out your mind. I could not disagree with your thinking enough. How many games did Ramsey win for Jacksonville? None. How many games does Wilson sin every year for us? Guarantee the answer is way higher than Ramsey will ever produce. Great notes on all these guys. I think it is very interesting that Seattle is reportedly high on Peters. He’s the guy I’m probably going to watch the most. He left practice hurt yesterday. Let’s hope he’s ok today. Didn’t see any tape on him, but based on your description, I WANT Mack Wilson. Great in coverage and hard hitter? If he’s smart and a good character, he could be our next KJ. We won’t get an Aaron Donald type of guy after trading back. As for DT/DE, I think we can get the similar type of guy in the early second round and mid-late 3rd (after trading back). So if we can get a baller LB in the early second, I’d go for it. I’m not too concerned about DE. We have Green and Martin also who might step up big next year. For DT we have Reed for #1 DT. We need another good DT, but we also have Poona. Not sure about the guy’s ceiling. We need to get better stopping the run and rushing the QB. But we might already have guys who’ll bring that next level DL play. Not saying that we don’t need DL help. We should get at least 2 guys (1 DT and 1 DE). But I trust Poona/Green/Martin/NazJones/Jefferson more to have a breakout season than Calitro or Shaqueem Griffin. Yeah, we might have KJ or Kendricks. But KJ might have a couple of good years left? Kendricks is totally up in the air. And we could have 2-3 run stuffer DT for the price of ONE KJ or Kendricks. I’m very happy and prepared to consider a LB. However — I just think this is a situation that can be solved by Kendricks. And I’m not sure the Seahawks take a big step forward on defense with a rookie LB. To me, they need a player who can flat out impact the QB and force turnovers. Be it a playmaker at the back end or up front. A linebacker can have a big impact in that sense but I’m 50/50 on whether that guy exists in this class. I really don’t think we have the DL pieces to take the next step. Not close really. Not compared to the top teams in the NFC. I watched a lot of Wilson last night. There are some good coverage moments, some very hard hits. Some nice play. But there’s a lot of ‘meh’. Some plays where he gets flushed out too easily or struggles to cover a RB on a wheel route. He wasn’t an amazing tester at SPARQ so I’m not expecting a 4.5 forty. I think if we draft a LB in round one I want fantastic speed. – 2018 Big 12 defensive player of the year. – “Mr. TFL”: 19.5 tfl, 7 sacks, averaged 9 tackles/game. – Knee surgury and offseason shoulder surgery on his medical history, missed first 4 games of sophomore season (knee). – Energy guy, swag, “the guy” on D.
– Quick recognition, patient and then and fires to the ball, running through would-be blockers on the way. Tape rat. Instinctive. Picks great moments blitzing. Hardly ever fooled by play action/misdirection. – Incredible at identifying the quickest way to the ball carrier and not sifting, but shooting through the “trash” to get there. Great angles. Can duck under blockers as well. – High motor. Almost always ends up around the ball by the end of the play. – Undersized (short), but just won’t be denied. Fights to get off blocks any way he has to. Life as a Mountaineer – David Long Jr.
– Motivated by being called “too small”. Competitor. This guy is cool. Flys around and plays with no fear. Watched a little Vosean Joseph who V12 pointed out and he looks nice also. What range are these guys expected to go? Guys that are “too small” seem to work out well for the hawks. Russell Wilson, Tyler Lockett, Poona Ford, Doug Baldwin, even Bobby Wagner & Earl Thomas were considered undersized coming into the league. Loving all the player shoutouts from Sea Mode, Volume12, JimQ, C-Dog, Trevor and everyone else that contributes. No doubt we’re going to get some good players in this draft. Cole Holcomb as V12 pointed out is another one of these speedy, undersized WILL types. I’d rather not go too small at WILL. The run D was bad enough as it is. Good point. Need length to keep off of blocks. I’m more worried about some of these guys tackeling than how much they weigh. Couple big wiffs from each of them. The WILL should stay pretty clean if everyone is doing their job. If we want someone that can fly, most of those guys are “undersized”. I guess we already have a speedy undersized WILL on the team in Queem Griffin (also iffy tackling). Competition never hurts though. Got any linebackers (besides devin white) that can fly, with plus size and might last past our first pick? We need to see what Devin Bush can do. I wouldn’t expect Mack Wilson to be particularly fast or Kunaszyk. We need the combine here pronto to learn about this class and get some info. Germain Pratt could be a bigger guy that can fly. Haven’t watched him yet but that’s the word. Can’t wait for the combine. For the time being I’m using the ole eyeballs to see who is fast. Yeah, we need more horses on that DL. Im not sure they currently even have a legit starting front 4, as DE has Clark and some decent rotational pieces. Lose Clark or Reed for any length of time and that D is done. You’re exactly right. They basically have two appealing players on the DL and a bunch of depth with some potential (eg Rasheem Green). They need so much more. In the past they were rotating Bennett, Avril and one of Clark or Clemons. They’d have a solid interior rotation. The top teams have multiple BAMF’s on their D-line and Seattle need more than they currently have. And if they’re trading down out of range for those types in this class, they’ll need to find some solutions in FA. I think they will certainly hedge their DL needs with some FA moves. Not big money but some choice additions. Just to provide some security. What do you think about our younger guys? Green seems to have the talent and the athleticism, just rough. Do you think he could be at least in heavy rotation next year? Can he break the lineup, or most likely he’ll need another year? I never jumped on the Poona hype train. He was a steal and he’s good, but let’s be realistic…He won’t be Reed. But I hope he’ll have a good season with solid run D# and like 1,5 sacks, 2-4 TFL. Not sure about his position. He has solid size (bit smaller than KJ or Mingo but around the same weight. Bit smaller than our DEs and bit leaner too). Was only able to get pro day data on his combine related stats, but he was better in almost every category than KJ (roughly the same numbers, but a bit better). Mingo was a freak at the combine, so yeah Martin had worse numbers than him. Not sure about Martin’s coverage skills. He almost could be an SS based on numbers. He could be a bit smaller-leaner, but fast DE. Depending on coverage skills he could be an OLB. Not sure where did he line up the most, but I guess SAM? Could he push out Mingo for starting SAM? Rob is Murray who you think Schneider was in WV to see? Anyone else on the rosters that you think the Seahawks are interested in? Marquise Brown possibly? The Hawks like the smaller WRs. I think there will likely have been a few players he wanted to watch. But my guess is, knowing what we know about John, he couldn’t resist getting a first hand look at Murray. Here’s an interview for you too! Thanks guys! Really appreciate it. I think Betts may have a shot as a UDFA if he continues to play well this week. I think he will standout in the game as he has more advanced pass rush technique than most other lineman there and has an off the charts motor. That will be his Super Bowl. Just don’t think he has the length to be a legit NFL pass rusher. I decided to give a little something a go. If you all like it, maybe I can continue it for Senior Bowl week as well. Since access is hard to come by, all we have are the clips and notes people post on Twitter and elsewhere. I was wondering who the consensus stand-outs are, so I put together a table that summarizes them by position. They are also more or less in order of the highest to lowest rated at each position (subject to my interpretation of each scout’s comments). If the author declared anyone the “best player out there” or “biggest winner” of the day, I highlighted that prospect in green. Maximum two per day. This will also indirectly serve as a test of the different “scouts” themselves, to see maybe who ends up having a better eye for different positions. I have them ordered from left to right according to my initial sense of reliability. Obviously subjective and subject to change. Anyway, enjoy and let me know if I missed anyone I should include. I think Daniel Wise and Kyle Phillips are two guys on this list to keep an eye on for the Hawks as possible day 3 guys. Surprised that CB Jamal Peters was not on here. I thought he might dominate this week. Hope to see Canuck Mathieu Betts on here tomorrow. Not sure he will have the measurable to be an NFL edge rusher as he only has 32.5 inch arms but he has incredible agility #s and an off the charts motor. I bet he gets 1-2 sacks in the actual game. Betts getting good reviews already today. People saying he’s got a wicked spin move. Stunner: The #Colts are letting OL coach Dave DeGuglielmo go, sources say. That line made tremendous leaps this season. But Frank Reich wants his own guy. DeGuglielmo was the only offensive coach Josh McDaniels had hired. Reich is actually recommending him to other coaches. I suspect the Colts feel their three first round picks (including a #6 and #18) and second round pick are the secret to their success, not the coach. Glowinski was playing really well from what I saw too. I never understood why we let him go. And they got Desir from us who I liked. Anyway, I promise I was actually scouting for possible KJ replacements… Parents immigrated from Nigeria. He is 6-3, 234 and has KJ’s super long arms, but I felt he’s not fast or aggressive enough and didn’t really impact the game as much as I would have liked to see. Watched him vs. Notre Dame (2018) and ended up just reminded of how good a RB Dexter Williams is. I’d be tempted to take a shot on Williams on day 3 if he lasts. Maybe if we draft this kid and Tillery we’ll be able to get Kendricks that much needed financial advice? 😂. I think Carl Nassib might be a free agent. Rob, how does Ed Oliver compare with a guy like Grady Jarrett? Jarrett was about 25lbs heavier. Hey Rob, any players on your radar to watch in this Saturdays NFLPA Collegiate Bowl? A lot of players in the game play for teams I don’t have access to during the season. Obviously then there are players like Jake Browning too. But I’m not familiar with a lot of the names taking part. Browning, Cal LB Jordan Kunaszyk and WSU LB Pelluer are about the only players I recognize from the rosters. NFLPA week a year ago is when I first heard about Will Dissly excelling as a blocker and receiver. When a player has “options” he can be sent between the major and minor leagues freely by his team, but once a player is out of options he has to be exposed to waivers. Essentially his new contract will somewhat force the A’s hand to get him to the majors within 1.5-2 years so that if he initially struggles they can still option him back to the minors. Once in the majors he’d start collecting a major league salary (~$535k currently) and his arbitration clock would begin. After three years of playing at the league minimum Murray would be eligible for three years of salary arbitration. Based on what I’ve seen and considering a range of outcomes I think you could reasonably expect in this scenario he’d earn $1-3 million the first year, $4-7 million the second year, and $8-13 million in the third year. This would put his earnings over his first six seasons at the original $14.7-19.7 million + ~$1.5 million + $13-23 million in arbitration = $29.2-44.2 million. If he ends up being a superstar his arbitration earnings could also be significantly higher (ex. Mookie Betts, who earned $10.5 million in his first year, will make $20 million in his second, and probably $30-$35 million in his third year if he doesn’t sign an extension before. Total earnings of potentially ~$60.5-65.6 million). Now it could turn out that the contract Kyler signs ends up buying out some of these arbitration years at a slight discount but that seems unlikely since his agent is Scott Boras, who is probably the best agent in baseball at getting his players paid. Since baseball also doesn’t really do signing bonuses my example of contract structures is more meant to just paint a picture of how his first six years would look and what his potential earning power may be. In this case Kyler would pretty much need to be a Top-3 draft pick to make playing in the NFL worth it money-wise. I think he’s all in on football. People were still saying after the playoff game ‘he won’t declare’. But he has. And if he has to sit in the NFL — it’s no different than having to go through the minor leagues in the MLB. Objectively speaking he loses nothing by declaring, since it keeps his options open and gives him leverage in negotiation with the A’s. And when it comes down to it I think that’s the biggest aspect to consider, especially in light of what happened to Kyler’s dad – he was drafted by the MLB, quit because he wasn’t ready and wanted to go play college football, was sued by the MLB team that drafted him, had a stellar career at Texas A&M, and then was shunned by the NFL. There’s an eerie similarity to the whole thing and you have to believe Kyler’s dad is telling him to do whatever it takes to guarantee the largest amount of money possible. Throughout his whole career, actually, Kyler and his dad have perfectly played their leverage – Kyler committed to Texas A&M, then briefly flirted with switching to Texas, then went to A&M, transferred to Oklahoma when it was clear he wasn’t going to be the starter, and now this whole situation with the NFL & MLB. He’s always chosen the option that gives him the best chance at the best outcome. Considering in this scenario all things being somewhat equal between baseball and football money-wise, if he’s not a Top 3 pick does any team take him? My analysis obviously is subject to him making the major leagues within 2 years and being good (huge what if’s by the way), but if he doesn’t get guaranteed money in the NFL equal to what the A’s will give him now and in future arbitration and he has to sit behind a QB for a year or two, is there any incentive for an NFL team to draft him? It really is a fascinating situation that’s unfolding, and I don’t blame Kyler one bit for trying to secure the best possible future given both league’s try as hard as they can to limit early-career earnings. So ultimately in my opinion I think it isn’t quite open and shut what will happen, but it’s going to be interesting to see what does. I really think people overthink Murray and his situation too much. I think he genuinely just chose football. He just won the Heisman, just had an incredible season where he put up better numbers than Baker Mayfield and is clearly an insanely talented football player. Given the choice of driving on a bus around the minor leagues for two or so years, he’s instead opted to get paid more money to be a NFL player immediately. Everyone keeps second guessing him. ‘He won’t declare because of X’ or ‘He might quit football in a year because of Y’. I get why people want to have those conversations and try and get into his head. It’s probably just a simple decision. He wants to pursue a football career because he’s really good at it. Does anyone know when Kendricks sentence will officially be handed down? I’ve been googling and I can’t find anything on how long he’ll actually serve. No way to tell how long he will serve until the judge sentences him on that day, but it’s a possibility he could get either a few months and/or probation, and the Seahawks can re-sign him. Thanks! I couldn’t find anything. Rob nice breakdown of the amount of legit 1st round talent and I tend to agree with almost all of them. The only guys I had as legit 1st rounder’s whom the Hawks should take instead of trading back are. If one of these 10 players is not on the board I hope the Hawks trade back. There are 5 other guys who I think have 1st round talent I just don’t think line up with what the Hawks need most right now. I think Gay will be drafted! He’s likely going to be a day 3 guy, and if we have the ability to draft him I hope we do. We need a long term solution at kicker. Either draft him or bring in a solid known name vet on a 2-3 year deal. Maaaaaaaaaaaaan imagine being that dumb, wrong, and biased. It’s lazy writing. The news cycle is slow and so we have to deal with this trash. Yikes, Kenny on Kenny vitriol. Or did you mean the commenter is dumb wrong and biased? Because cut blocks still aren’t illegal. Although there is a new rule where guys are not allowed to chop guys down that are engaged up top with another blocker. Which to be fair was a part of Cables blocking scheme. It’s an oversight in an otherwise pretty well researched opinion piece. I don’t necessarily agree with K.A. but I thought he made some decent points. I’m by no means a K.A. or Cable fanboy. Despite the flaws I thought both the article and the comment you mentioned were much better done and more insightful than your ambiguous comment above. If he’s such a jackass why not put on your big boy pants and debate him instead of hurling insults? Anyone have a list of what games the hawks scouted this year and what games Schneider was at? I think we might be best off replacing Britt with Hunt and using the extra cash to lock up our guards. They don’t need to do either. Keep Britt, keep Fluker, keep Sweezy. All do-able and won’t break the bank. They don’t need to change anything up front. Keep Hunt too. Valuable backup C.
Just need to keep building reliable depth. Guys they would be happy playing if they had to, in case of OL injuries. There could be many more than this, but here ya go. S. Dakota St.@N. Dakota St.
Great work. Thanks for doing this. I’m gonna put together a visits/meetings tracker as well that we can keep updated. Already got the format from last year. Thanks V12. You sir, are a gentleman and a scholar. That last one in week 13 should be NC St.@ NC (North Carolina) not ND. Any one know if this is for real or speculation? Please let it just be speculation. Please. No more Percy H’s. Jason La Canfora has got plenty right regarding the Seahawks. He’s well connected. That said, I suspect Seattle’s name is on that list not because a trade is likely but simply because they explore every opportunity. Brown would be a sensational fit for this offense but trading a first round pick for a 31-year-old, disgruntled wide receiver isn’t very likely. He’s much more likely to end up in Oakland with their multitude of R1 picks and need to make headlines (and get better fast). 1. It’s Jason La Canfora, who is an utter clown that provably just makes stuff up. 2. The actual quote is that the Steelers expect to receive interest, and that someone (some random low level guy with the Steelers? JLC? An imaginary person existing only in JLC’s head?) expects the Seahawks to be one of the teams expressing interest. This is less than speculation. I think JLC deserves more credit than that. He’s broken his fair share of Seahawks stories and has a source in the F.O. And I’d fully expect the Seahawks to make a call about Brown. I also fully expect he’ll be traded somewhere else (eg Oakland). JLC also was wrong about the Earl situation like 8 different times. A couple of the reports left no gray area and yet Earl was never traded. I don’t put much stock into his sources anymore. JLC wasn’t ‘wrong’ about the ET situation. He asserted he expected a deal and discussed high prices. I suspect that’s because that is what his sources in Seattle were saying. He asserted his belief it would happen. He didn’t guarantee Earl was being moved. And even if he did, there may well have been a belief in Seattle he was definitely going to be moved. It felt that way at several points. Don’t really get the negative JLC sentiment. He definitely gets scoops about stories. Now when it comes to talking football, and gossip/rumors, sure he’s a clown. But like I tell people all the time, 98 percent of the deals that we’re involved with, we don’t follow through with. But at least we’ve opened that door, gone down the road and seen what’s behind door A or door B. You either are competing or you are not. So we have always had to be open to every suggestion that comes along. V12, follow up on your question at the end of last thread: no, I haven’t seen Daniel Wise yet. But sounds like he has been a consensus stand-out at the Shrine practices in both days so far. Have you seen any of Rutgers DT Kevin Wilkins? Dude’s got a backstory, but I couldn’t find any tape at all. I havent. And I was not impressed with Daniel Wise. Granted it was only tape from !last year, but it was rough. You checked out Temple’s Michael Dogbe? – Quick get off the snap. Good hand fighter. Shed and tackle. Spin move is go-to counter to get off blocks. – 12.5 tfl, 7 sacks. Single digit jersey. – vs. UCF 2018: Impact seemed to fade in 2nd half? Just got his measurements too: 6031, 286, 33.25 arm (and we know we can usually add at least 1/2 inch to Shrine Game measurements). So that’s really nice length. Great stuff! Definitely a guy to monitor. Where can you find the Shrine game measurements for all the players? I like him a lot. Glad you took a look too. Think he’s gonna be a gem in this class. Delvon Randall 6-1 215lb S/DB could be a good slot replacement and compete @ FS. They also could be keeping tabs on Isaiah Wright WR/KR, a ST highlight reel. I was hoping he’d declare. No E needs a breather from those duties, since his high catch rate will demand more touches. Could be. IMO it’s always worth checking out the Temple single digit guys. Great program. I was underwhelmed by Delvon Randall, although Pauline said something to the effect that he was also lukewarm on him, but has seen another dimension of his play at the Shrine Game practices that might force him to take another look. At this point, I don’t think he offers more than Delano Hill (and almost certainly he’s not as fast), so I would find it hard to invest a pick on him. Liked the hard hits though. But Dogbe IMO has potential to become something special at 3T, and I think that will have caught the Seahawks’ eye. Great size, physique and length, really quick get-off, strong hands, productive, and a team leader. There’s a lot to work with there. TJ Hockenson getting love from just about everywhere. Wonder if George Kittle’s success will also help boost his draft stock. I’ve watched him twice and came away extremely impressed. Better than Fant by a mile, IMO. Blocks well. Happy to do all the dirty work. But so smooth at the second level, very reliable hands. He absolutely had Johnathan Abram for dinner on one snap in the Bowl game. Total mismatch. If I was a team looking for a TE from this group, I’d be after Hockenson. Hockenson is a legit first rounder to me. What more do you want from a tight end? Didn’t see him mentioned in this article but I think he deserves to be. Hmmmm I like him but I wouldn’t say a legit R1. Aaaand, Seattle meets with yet another WR, Shrine Week star (so far) Terry Godwin, Georgia. Possibly indicative they they intend to try and find some WR gem’s later on. If Brown is gone, which seems likely, WR depth seems key. Which says to me that they also might like Old Dominion WR Travis Fulgham and Georgia WR Mecole Hardman. I know next to nothing about the dude they met with yesterday, but Godwin is very underrated. What ended Seattle’s season this year? Consistent pass rush, sure, but lack of conversion on 3rd downs. Not enough weapons. Your third down, it sure is open for a lot of questions and discussion. I am really not sure what the issue was on third down. Was it really a lack of weapons, playcalling, execution, or something else? I’d sure like to answer that question, but not any more than the Seahawks FO. I really like what I have seen from Hardman!! As for JS watching Murray…. he could also be looking at his WRs or TEs or RBs…. sometimes you go to watch one guy play and someone else catches your eye. *******Maybe even Marquis Brown, WR, Oklahoma. He is small, but he is FAST AF. Explosive play making potential. Keep an eye on him, he is a legit 4.35 speed guy. Yes it is possible John was looking at others. But I’d bet $100 John was at that game to get a live look at Murray first and foremost. Thoughts on David Montgomery rb from Iowa st? Lead the NCAA in broken tackles 2 years in a row. Seems to have the Seahawks physical profile. Highly thought of in the pff world. I’ve seen him ranked all over the place. Mid round pick? Or will he go early? Really like him and have been a bit surprised to see him projected in some places as a Day 3 pick. I think R3 is more fair. Just like we saw with Kareem Hunt, elite balance is his outstanding trait. He’s not going to blow by anyone with speed, but he’ll consistently get you the tough yards. I think the comparison is fair, and that bodes well for his draft stock. He was also coached by the same coach who had Hunt at Toledo fwiw. He’s also the #3 rated pass blocking RB in the country per PFF, which help his chances of early success. I haven’t done a lot of digging yet, but he does come from a rough background in poor neighborhood of Cincinnati and has a brother in jail for murder. Sends him money from his scholarship every couple months. To know if he’s really a fit for the Seahawks, I think we will just have to wait for the combine and pro day to see if he is explosive enough. I always look for how the RB’s get their yards, I’m sure others do too, and that dude works hard! Not just hittin holes and off to the races. I will watch for him and where ever he goes. Gotta like he lead the nation in broken tackles not one but two years in a row. I like the hunt comp! He’s never looked like a top-10 pick. I have no idea why he has ever received that level of attention among draft writers and tweeters. Not a tackle. Not strong enough. Not athletic enough. Might be a decent guard if he can get stronger because, as always, such a move hides limitations. I would take Cody Ford and Michael Deiter before Williams and would certainly consider Greg Little too. Presumably the same will happen with Williams that is happening with Deionte Thompson. Todd McShay just moved Thompson from #8 in his ‘rankings’ to #26. The truth is both Alabama players have been wildly overrated. Agree completely. I think the less heralded Mack Wilson goes before both of them because of his ability in coverage which is incredible an incredibly valuable asset for an LB in today’s NFL. The general take on Antonio Brown and his potential market value: 2nd round picks in 2019 and 2020. I’m averaging here and making some speculation, but that would be the most widely accepted opinion on what it will take to get the disgruntled 30-year-old All-Pro WR out of Pittsburgh. I find it really hard to believe that Cooks has been traded for a 1st (twice!) and Cooper was traded for a 1st, but an all time great HoF lock like Brown would only get a couple seconds. Age is a big factor. Brown is 31 this year. Brown is 30 and his Steeler contract calls for $50-60m over the next 3 years. Cooper is 24 and was paid peanuts this year. And next year his $13-14m hit is not hard to swallow. Cooks was in his early 20’s and on his rookie contact but producing like a Pro Bowler. Pauline says Seahawks like Buffalo LB Hodge 6’1 235lbs he can add 15 lbs of muscle too. Hodge is another San Joaquin Valley guy Stockton-SF-Buffalo projected 2nd/3rd round. Tony said Keesean Johnson would have won the best player of the day award but he gave it to a RB who proved to be a good catcher & route runner. Johnson could be a 2nd rounder if he runs sub 4.5 exact situation Davante Adams was in. Adams & Johnson grew up same neighborhood, same High School, same college, same contingent of representation for NFL. Did Tony say this in a podcast or was it in an article? Shrine Game Tuesday podcast. But he didn’t say the Seahawks “like” him or “have shown interest”, only that Hodge is seen as a fit for the Seahawks. I heard this same take yesterday somewhere else too. That’s interesting. I’ve not watched any of him so just catching up now. Watched a bit of him yesterday (2017 highlights + vs. Ohio 2018). Thick lower body like Wagner and plays the run like Wagner, but is he fast enough to run to the sidelines and drop into coverage? Maybe worth it early on day 3 to give Bobby some snaps off here and there? Got a post on him (with some notes on Hockenson, Deiter) coming later today. Nice find. I stand corrected. Kahlil Hodge is an explosive run defender. A lot of people think the Seattle Seahawks are very high on him. Listened to the Tony Pauline Shrine practice day 1 podcast too, and he said something like people he talked to thought that Hodge would be a good fit for either the Seahawks or Steelers. Said he has an unusual frame in that he has a stocky strong lower body, but not as strong on top, and have read elsewhere he has great instincts and stats, but runs a 4.6 to 4.7 40, seems too slow for what we need. They did mention DTs Daniel Wise and Cortez Broughton looked very good, but in addition to WR KJ of Fresno St. looking very good and getting separation with good route-running, they were very impressed with GA WR Terry Godwin and Utah St. WR Ron’quavion Tarver, 6’3″ 215 – he also got separation, ran good routes and caught the ball away from his body. Saw this Tue. night “An intriguing target who improved greatly on day 2 was Ron’Quavion Tarver who looked more comfortable in and out of routes today. The long Utah State receiver was firstly impressive as a blocker during inside run but also has some wiggle to his game at 6’3 215 pounds.” A big, fast WR who gets separation, runs good routes, and can block? Sounds like a possible early to mid day 3 prospect if we acquire more picks. Another under-the-radar day 3 pick could be OL Josh Miles of Morgan St., and Tony thought very highly of his size, footwork and agility. Said he talked to someone in the NFL community who thought he had the talent to eventually become a good starter after some coaching. Also may have that chip on his shoulder we like in that he missed 2017 due to grades, but got them back up and worked out like a madman in the weight room and doesn’t have any fat on him at 6’6″ 310. Have read and heard overall that there are almost no notable QBs or TEs, hardly any OL, and 3 WRs stand above the others with separation, routes, etc. – Godwin of GA, Johnson of Fresno St., and Tarver of Utah St., and that west DTs Wise of Kansas and Mack of Texas A&M have looked outstanding, but to take that with a grain of salt because the west OL is terrible. LB Gilbert of Akron has looked fantastic for the east, as has Malik Carney as a DE/pass-rusher – he’s Jacob Martin size – 6’3″ 245, and had 8 sacks in 8 games for NC, but was suspended at the start of the season. Tony mentioned that someone pointed out to him DE/LB Justin Hollins of Oregon ran the 100 meters in 10.56 in high school, and although he is taller and heavier, still looks very fast and played better than his highly touted teammate Jalen Jelks. This is what Pauline wrote about Hollins on 11/26/18: “In 12 games Hollins has totaled 57 tackles, 12 tackles for loss and five sacks, topping Jelks in each category. He also broke up seven passes, forced four fumbles and has five hurries. He’s similar in size to Jelks as both measure 6-foot-5.5 and tip the scale around 245 pounds, though Hollins is slightly faster. I gave him an early sixth-round grade over the summer and believe Hollins will be a steal in the middle of Day 3.” He had 7 tackles, 1.5 sacks and 2.5 TFLs in their bowl win over Michigan St..
And some bad news. Heard on the podcasts that Miss. St. CB Jamal Peters has shut it down after an undisclosed injury and will not play in the game. Hopefully it’s minor and he just wants to let it heal before the combine in late Feb..
Worth noting KJ Wright ran a 4.75 forty. You’re right Rob. Seems like LBs sometimes more than other positions, with the right instincts and aggressiveness, can just make plays. Lofa Tatupu wasn’t fast or even big at 6’0″, and had over 100 tackles each of his first 3 years with the Seahawks. And 5’11” LB Chris Borland wasn’t that fast, but had over 100 tackles in 8 starts with the 49ers in 2014 before deciding to retire. A more recent example – LB Darius Leonard had 14 tackles in less than 3 qtrs. in last year’s Senior Bowl; 163 tackles, 7 sacks, 4 FF and 2 int’s for the Colts this year as a rookie, and ran 4.7 at the combine 10 months ago. I’m sure some of the other intangibles are even more important than speed if the faster player can’t make plays. We’ve had a few LBs who ran 4.5s like Curry and KPL who couldn’t cut it. Saw this at the Athletic on BW and KJ’s chemistry, don’t have the $ to afford the rest of the story. Sure going to miss them together as Seahawks if he leaves, and if he does, would rather it be the Colts or almost anywhere else but the 49ers. “The first thing you need to know about Bobby Wagner and K.J. Wright is that they are different. Take their hair, for example. So whenever Wagner gets a haircut, Wright can’t help himself. It gets under Wagner’s skin every time. A few weeks ago, Wright fired off his usual comments — but this time Wagner fired back. lol. i miss the real rob report. It makes a lot of sense that Seattle would be sniffing around linebackers. Even if they bring back Kendricks or KJ back, depth is still a major issue, IMHO. They need someone to can tackle and cover, and stay disciplined. Hodge looks like he checks those boxes. Makes sense that they would be into him. This is why I have a problem with PFF though. I’m really happy for Poona that he had a solid start to his pro-career. But does anyone honestly believe he warrants being the highest graded rookie defender in 2018? Yeah, I hear you. Of course not. To me, PFF grades just mean, “he’s doing something right, take a closer look.” Kind of the same way good combine numbers or TEF can help unearth potential gems. In Poona’s case, getting him in UDFA just makes any kind of recognition worth celebrating. Does anyone know how they make overall grades? For example Chris Carson has 84.4 overall and 82,2 for run, 64,8 for receiving and 62,4 for pass block. I don get it, how is it possible that overall grade is higher than any other grade? It’s one of football’s greatest mysteries. How PFF became as prominent as it is. Maybe it’s just our thirst to slap a number on everything these days? But while ever they’re posting BS like Aaron Rodgers getting a negative grade for a 5-TD performance in a win against Kansas City, it’s hard to take seriously. I really like Omenihu and I know several others like Seamode and Vol12 do as well. I think he is a little thicker than Anzah and I don’t think as quick. Could definitely be a Hawks target is his 10yd split is sub 1.6 particularly if they trade back into the early 2nd round. If he has a good call combine he will be a big riser IMO. Defenders in the Big12 don’t get much love and we got a steal with Poona last year maybe lightening will strike twice. Any idea if they have posted the Shrine player measurements? Unfortunately, no. And it hasn’t leaked yet like last year either. I’ve been trying to milk some measurements out of one of the media scouts there. He gave me Michael Dogbe. Now I asked for the guys Seattle has met with. Let’s see if either he replies or the list gets leaked. Did not really get much attetnion but I think Wagner’s decision to dump his agent and represent himself is an ominous sign for the Hawks particularly if they let his pal KJ walk this off season. There seems to be a belief that Wags will be an automatic resign and as much as I hope they get it done this off season I think it is far from a lock. It certainly did not go well with OKung and Sherman. If KJ goes Bobby is the last of the LOB and I really wonder what his mindset will be. I certainly don’t think the Hawks will be getting a hometown discount anytime soon. So my question is this. If the Hawks cannot extend he best LB in the NFL this off season and he tells them he plans to test free agency what do you do? Trade him and get value or let him walk like Sherm and Earl? Once again to be 100% clear I think they should do whatever they need to in order to extend him this off season and I think they should sign KJ too but what if they can’t? In fairness though, they didn’t negotiate a new contract with Sherman. They were moving on. They cut him. With Okung there was a lot of feeling he was ready to move on to a new scheme when he reached free agency. He ended up signing a rubbish contract in Denver to play in a supposed pass-friendly scheme. Not sure the Seahawks ever seriously negotiated with either. With Bobby, they will be. So no. They won’t trade him. What if Polite falls to #21? I’m not sure he will be a top 10 pick only because of all the talent and maybe 3 quarterbacks going early. If he does fall I would have no problem with the Seahawks staying put and drafting him or even trading up a bit using next year’s stock ( we are already used to limited draft stock so why not). IMO it’s the best option if we truly are in a win now mentality. He would instantly solve the d line issue, then we can draft a cb and wr in round 3 and 4 and go for some low costing free agents for depth. What’s your opinion on this? if he he falls of course. One player who may or may not do well in the pros, is not worth the 3-4 extra players we can pick up in later rounds with the picks from trading down. Agree totally about Deiter. Granted, the focus of the draft would be to bolster the DL. But, you also have to guard against opposing DLines. Due to injury concerns, would it be prudent to take Deiter with their 2nd or 3rd pick in the 3rd Rd, if he’s available? Another option is Missouri’s Paul Adams RT/OG in the 5th or sixth Rd. I would love to see them double dip for OL help. These two will be long time starters in the league. 6’5″ 245 lb. DE/LB Justin Hollins in one-on-ones at Shrine game practice yesterday vs.
That doesn’t look good! I’ll give him a little slack, since he works on the right side. Probably there’s a reason he was on the right side. His tape is in no way like this. Hollins seems to have worked up a lather as well. I had Hollins as one of their Rd picks. Adams looked good a lot of the time. Tony Pauline tweeted Monday – “Paul Adams/T/Missouri also having a strong outing.” And have seen good reports about him this week elsewhere, one to watch, we do need a rookie guard/C or G/T, either a day 3 pick at guard, or udfa and/or FA to push our other guys at least, or fill in if we lose one of Fluker or Sweezy either to FA or injury next season. They both missed several games this year to injury, as did their backup Simmons, and Pocic didn’t look good at all in the games he played in their absence. Would like to see us continue to upgrade from Hunt and Simmons at G/C, ideally the new strength coaches will get Pocic to put on 15-20 more lbs. of muscle and he will play great in reserve or starting next year(s). Rob, have you seen PJ Locke III from Texas? Thoughts? They also signed Alex McGough yesterday, in case we still cared, so I guess we’ll need to find a new arm for camp.